I’m not heading to NYC anytime soon, but if any of you art-loving Minneapolitan families are, the Cai Guo-Qiang exhibition at the Guggenheim looks like a great show to check out with the kids. 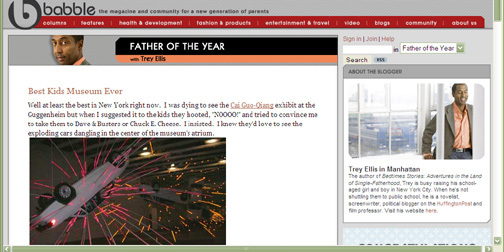 Trey Ellis, author, screenwriter, film professor, blogger on Babble.com, and father of two just posted a sneak peek at the artist’s series of exploding cars seen in the atrium of the museum. How cool! Check it out! I’ve had my own favorite animal and car sitings in the gallery! P.S. Trey, I have already purchased my copy of Bedtime Stories, and I can’t wait to read it!